Sometime in April (I can’t quite remember the date now) I took the train down to Okayama to meet my friend Hiromi for a stroll through Korakuen, which is rated as one of Japan’s top three stroll gardens. The last time I was there, with my friend Lea, it was pouring down rain and we didn’t get a chance to see much of it, except for the plum grove, which was strikingly beautiful in the rain. This time the weather was fine, and Hiromi and I were able to stroll through the garden properly (alongside 10,000 of our closest friends). In an especial stroke of luck, the Masho-an Teahouse happened to be open so we were able to drink matcha with wagashi (tea sweets) inside the building itself. We were also able to walk over to the crane aviary, which Lea and I had only heard off in the distance. (Distance seems much more distant when buckets of water are being thrown over your head.) This was actually a disappointment since the cranes are in large metal cages and suddenly you feel more like you’re at a zoo than at a garden. Of course, I admire the the fact that cranes, which are rare birds, are being bred here, but it is a bit strange to see such large and beautiful birds cooped up in cubic rooms. 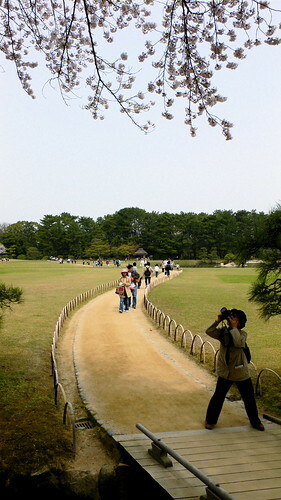 A photographer shooting the blossoms near one of the entrances to Korakuen. 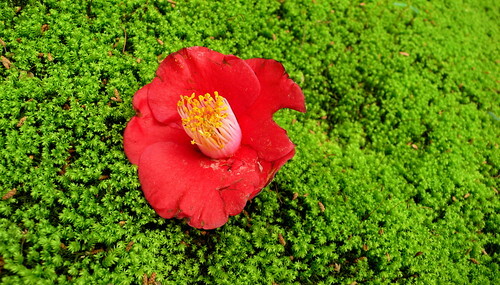 A camelia in the moss at Jizodo Shrine. Apparently camelias, called ‘tsubaki’ in Japanese, were thought of as bad omens by samurai because they’re reminiscent of decapitated heads. The idea here is that decapitation means dishonor because you only lose your head if you’re unable to go through with seppuku and your second has to finish the job for you. Of course, I’m generally bad with flowers, so these might not be camelias at all. 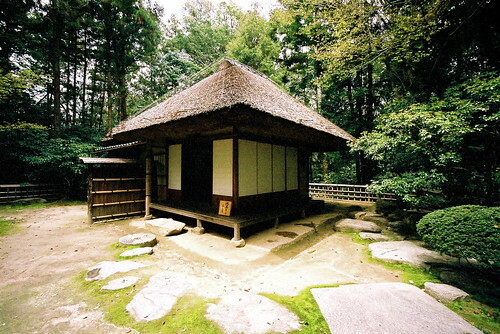 A view of the Masho-an teahouse. 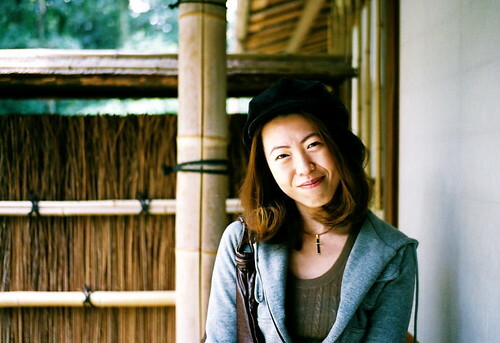 Here’s Hiromi in front of the Masho-an teahouse. 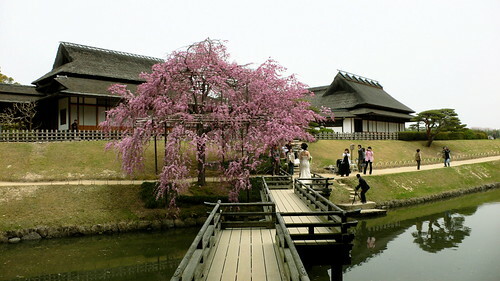 This beautiful weeping cherry sits at the end of the Eisho Bridge, and is clearly the perfect backdrop for wedding photos. 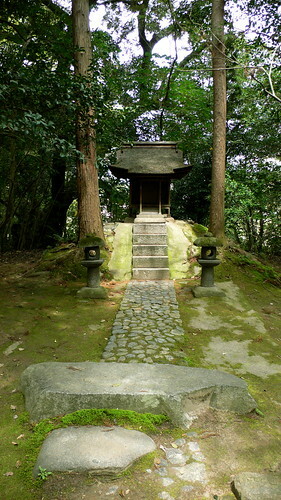 That’s the Enyo-tei house in the background. 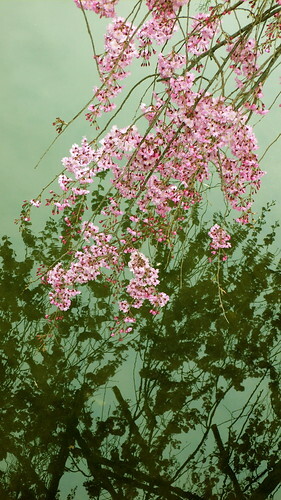 The pink blossoms of the weeping cherry reflected in the waters of Kayo-no-ike. It’s this kind of designed viewing and formal elegance that makes Korakuen so famous. This area is absolutely one of my favorite spots at Korakuen. There’s an isolated teahouse on the island on the right, which is called Nakanoshima. 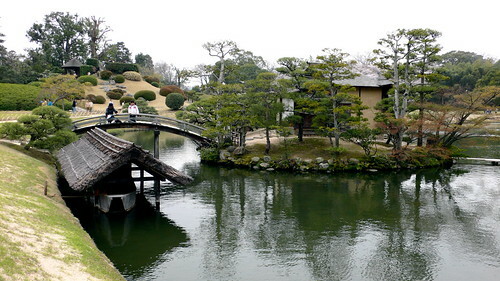 Of course, the house itself is off limits, but you can walk across the bridge and get close enough to imagine the sense of isolated quiet that must have accompanied the tea ceremonies held here. The view from the island across Sawa-no-ike pond is really beautiful, though perhaps not quite as beautiful as the thatched roof of the boathouse. 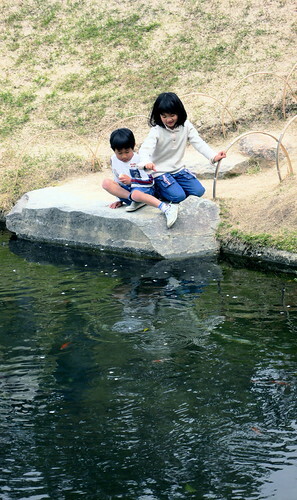 In the background of this photograph you can see Yuishinzan hill, which was built to allow for a panoramic view of the garden. 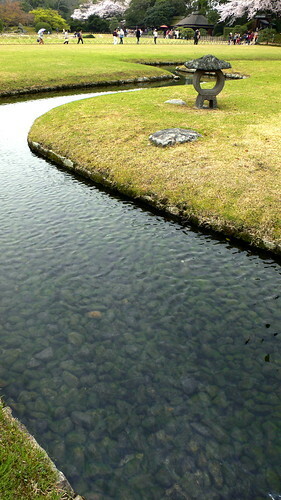 A view of the Gojusantsugi Koshikake-Jaya teahouse on Nakanoshima island. 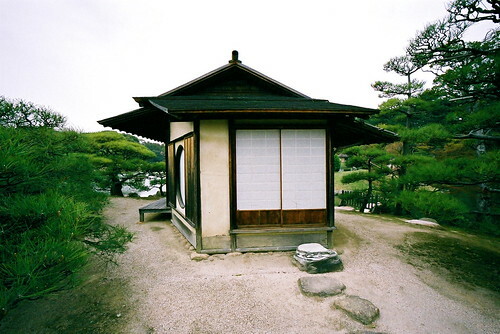 I’m pretty much in love with teahouse architecture. 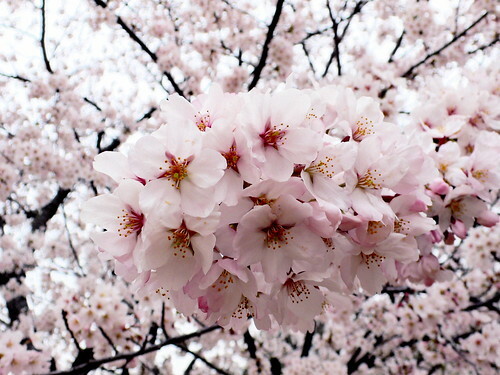 Of course, Korakuen is an immensely popular spot for blossom viewing, so the cherry grove was thronged with people. 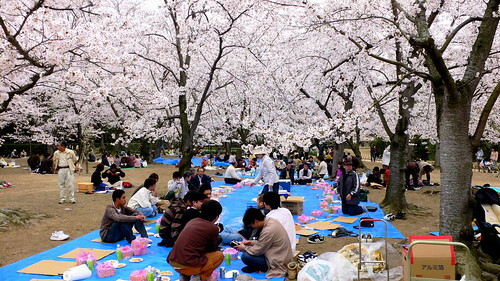 As well as the ubiquitous Japanese blue tarp, used in equal amounts for picnics and homeless shelters. 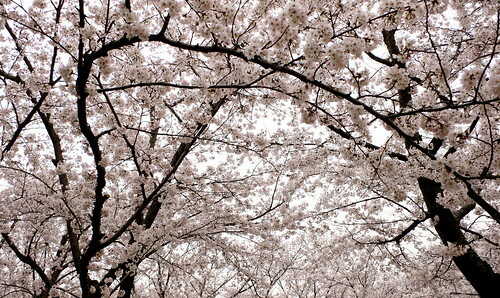 Korakuen’s cherry grove in full bloom. 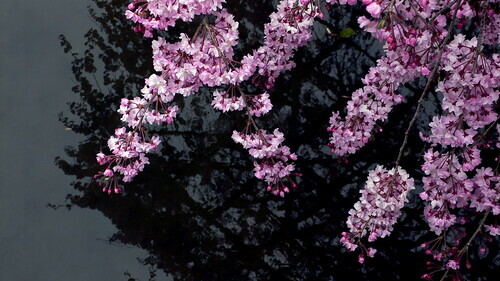 A closer view of the blossoms in the cherry grove. After Hiromi and I finished wandering through the cherry grove we ran into the same wedding party again. This time the bride and groom were being perfectly positioned for a photo op with blossoms. 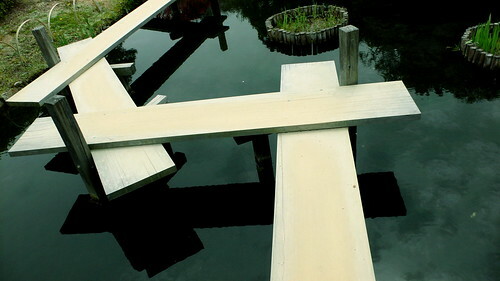 The zig-zag of the Yatsuhashi bridge slows you down as you walk through the raised barrel-beds of Korakuen’s iris garden. When this photo was taken in April, the irises were just beginning to put out their first leaves. 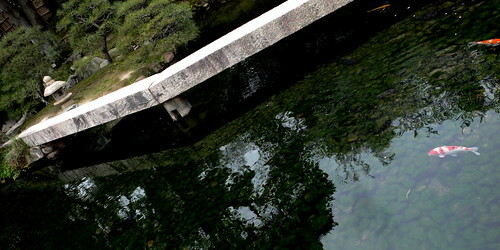 Stone bridge, carp, and pool at Korakuen. Next: erin and ann come for a visit!